Jack Crooks writes: For the currency markets I follow, and every other financial market right now, inflation is the buzz word. Each and every new report of rising prices releases new concern — whether the threat is revealed in Brazil, the United States, Europe or even your local grocery store. No one likes forking over more cash this month than they did last month ... for anything. But this inconvenient fact is being increasingly realized across the world. And that's where currencies come into play. Currencies are the medium of exchange you use on a daily basis to purchase goods and services. And you depend on that purchasing power holding its value. Soaring inflation means, among other things, that the credibility of the legal tender in your wallet is being called into question. If you have spent any time reading about the currency markets recently, then you are probably aware of the biggest driver behind exchange rates — yield. A currency's yield, or interest rate, relative to its competitor currencies, has always been the most powerful driver of currency prices over time. It is the respective central bank that has control of said interest rates. And it is the movement of prices, and sometimes the growth of the economy, that dictates how the central banks alter interest rates. The rate of inflation is the common factor that all central banks use to determine what they'll do with interest rates. They want to limit the increase of prices that are directly correlated with the increase in money supply. In order to do this, they raise interest rates, making borrowing more costly, and effectively reducing the growth of money. Since fewer people are willing to borrow at higher costs, they'll have less money to exchange for goods and services. With oil and food prices rising so sharply, warning signals are popping up all over the central banks' radar screens. And the number one question currency investors are asking is: Who's raising interest rates? 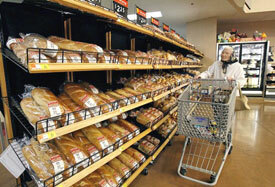 Already pinched by soaring gas prices, consumers are taking another big hit to household budgets as food prices explode. The answer will tell them much about a currency's investment appeal. For example, suppose the benchmark interest rate in Australia sits at 7% and the benchmark interest rate in New Zealand also sits at 7%. Now assume the Reserve Bank of Australia determines they need to counteract rising inflation by raising rates by .25%. Also assume that inflation is not yet a problem in New Zealand so the Reserve Bank of New Zealand does nothing. Now that the rate in Australia is 7.25% and the rate in New Zealand is only 7%, investors will seek to put their money into the Australian dollar because it now delivers a higher yield relative to the New Zealand dollar. As a result, the Australian dollar will appreciate against the New Zealand. This assumes that everything else on a relative basis stays the same, of course, that expectations for growth in the two underlying economies don't change. Currency traders are grappling with four issues as they assess the future course of interest rates. 1) Surging Prices of Non-Discretionary Consumer Goods — You already know this because you see it at the gas pumps and the grocery stores every day. It's no big secret, but it is a pretty good reason for central banks to take action. At least I think so. 2) The Lingering Financial Crisis — Central banks would usually be lowering rates, in order to keep growth alive and the consumer happy, given all the problems in the housing and consumer credit markets. But it is tough to justify those actions when prices are soaring. No self-respecting central banker wants to be responsible for unleashing the inflation monster. 3) Exchange Rates Near Historical Levels — The Fed is concerned that if the dollar falls further, it will only add more risk to the system and exacerbate inflation, as more speculators rush to commodities out of both weak dollar fears and an inflation hedge. This means the Fed might be forced to act more aggressively than would otherwise be justified. Remember, there's a whole new element added to the equation when global investors begin to lose faith in the world reserve currency. And given that the Fed is the world lender of last resort, if the players don't want the stuff it lends, then the Fed's ability to "save the system" is limited. 4) Prior Decisions Play a Role — On a similar note, the European Central Bank has kept its benchmark rate steady while the U.S. Federal Reserve's benchmark has collapsed amidst financial market turbulence. The Reserve Bank of Australia's last policy change was to the upside. The Bank of England stopped short on an easing campaign that was expected to bring down its benchmark rate much further. Will anyone be playing catch, in either direction? Does the Federal Reserve Really Contribute to the Market Process? Let me turn for a moment to my friends who make up the Austrian school of economics. They devoted much time to analyzing and explaining something called " the market process ." You can easily rake in enough reading material on this topic to last you several days, but I'll give it to you in a nutshell: The market process is what creates complex and meaningful interaction among humans. It's the entire process, every little cooperative cog that makes human beings and their economies productive. Additionally, the Austrian school's view of the market process excludes any type of hierarchy, composed of just a few people, who are in charge of making decisions for everyone because those few individuals can't possibly do what's best to fully benefit the complex web of interaction that's made up of an increasingly expanding pool of skills, goods and services. 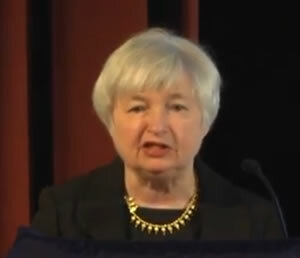 Janet Yellen, San Francisco Federal Reserve Bank's President and CEO, believes that with credibility, the Fed can constructively impact monetary policy. To give you a brief overview of the argument, the idea is that, with credibility, the Fed and the public work together toward the same goals. When this happens, one often hears the phrase 'the markets do all the work of monetary policy,' meaning that market participants correctly anticipate the actions that the Fed will make in response to economic news and shocks. This alignment of the Fed's actions and the public's expectations strengthens the monetary policy transmission mechanism and shortens policy lags. In contrast, in the absence of credibility, policymakers and the public may work at cross-purposes, and monetary policy must act to overcome and dislodge expectations that hinder the achievement of our goals." So is the Federal Reserve "useful?" Do they contribute to the cooperation of markets? The market process is based on the premise that people can accomplish more by working together. Ms. Yellen seems to think the Fed can be useful. I would agree that the Federal Reserve plays a role; unfortunately they have become critically entrenched in the system—solving problems of their own making. Bottom line: They better act appropriately when it matters most if they hope to salvage some credibility with the U.S. dollar. And if inflation is the real boogey man, they better not balk at raising interest rates—election year or not! It's going to require a collapse to make needed changes. That's the way this country works. The fed has no room to move at all if they try to prop the dollar the economy of America will collapse. I am afraid they have been far too busy printing new cash to service the unpayable debts. over the next 6 months The United States will become bankrupt the dollar worthless. the lies and the high jacking of oil prices will not save them. Americans have been too greedy too long now is the time of their reckoning.